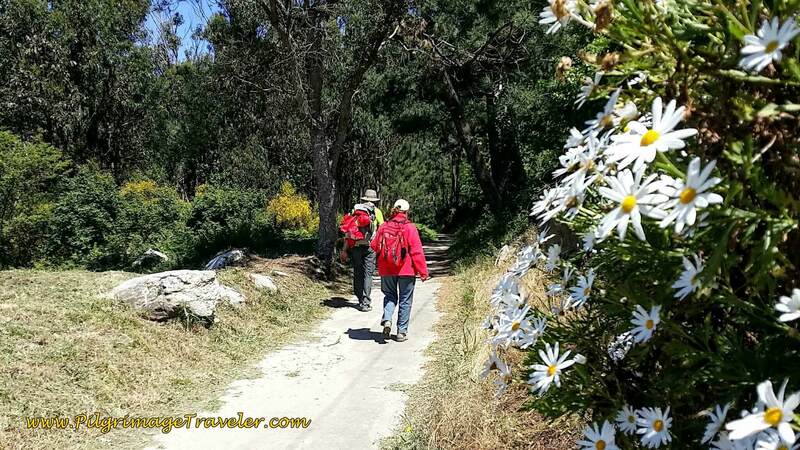 Our day nineteen on the Camino Portugués was an adventure, first getting across the Minho River, then meeting up with our old Camino Primitivo friend at the ferry station and joining together for a glorious walk along the Spanish seacoast to her house in Viladesuso. 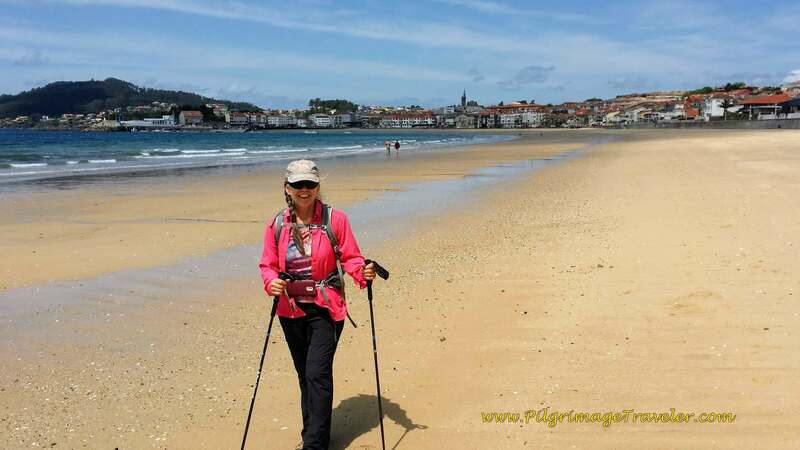 If you were able to take the ferry across the Minho, subtract 5.5 kilometers from the total I give above, unless you were planning to do the Sendal Litoral from the ferry landing in A Pasaxe. Then it would be very similar totals. If you are going on for the traditional stage to Mougás, add another 3 kilometers to my figures above. We were so lucky to be able stay at our friend's house! Here is my Google, interactive map of our GPS tracks. Open the map, zoom in/out and use it just like you always would! I have placed on the map points where we stayed, major pilgrim albergues and cafés where we ate. 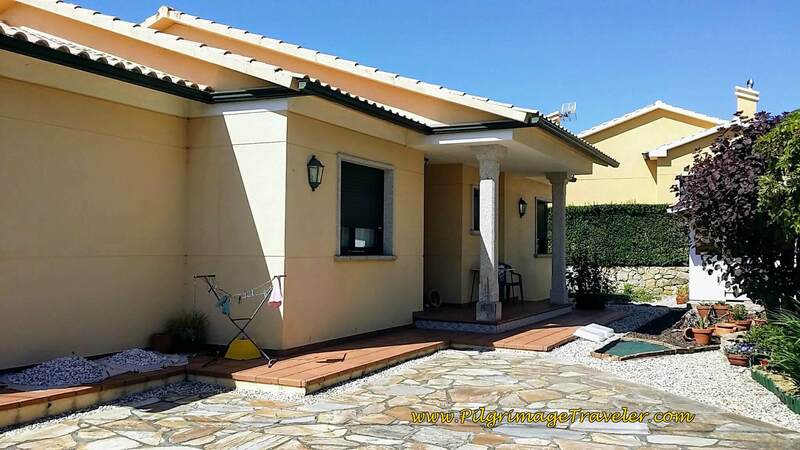 For a full spreadsheet of possible accommodation, click here. My elevation/mileage charts are in two parts. 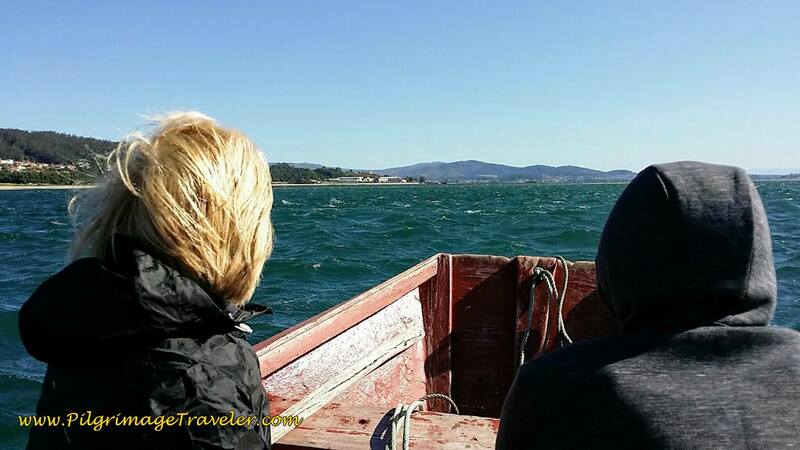 First is the trip from Caminha to A Pasaxe, which you can ignore if you take the ferry. There is almost no elevation change anyway, as we walked along the coast the entire time. 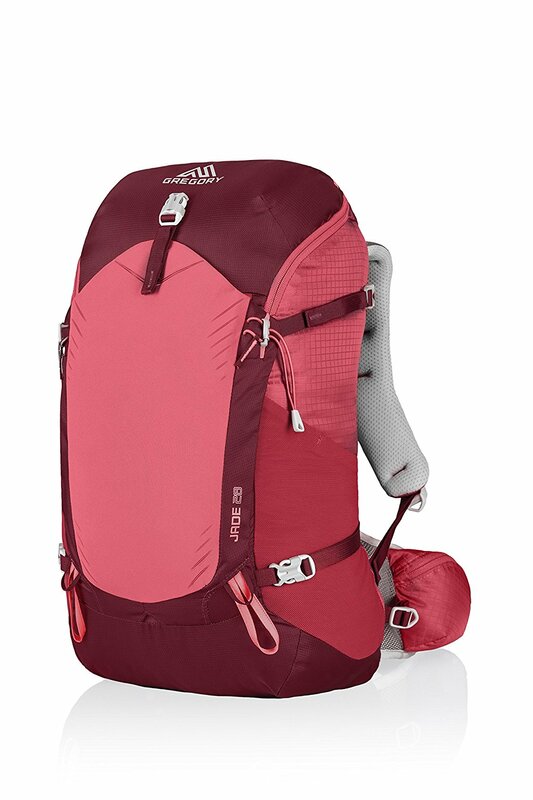 The second is the leg from the A Pasaxe to Viladesuso. (For the extension to Mougás, see day twenty.) You can see that there are several significant climbs along the coast, but nothing really problematic. We ate hearty, because the food was inexpensive, the place was actually open early and they had marvelous choices of pastries, sandwiches and empanadas. After breakfast, I decided to take a quick run down to the ferry dock to make sure that it was not running. Indeed, the tide was too low and most likely it would not run until later in the afternoon. You can see my GPS tracks from the square to the dock and back! When the meeting time arrived at the square, Janny was there, but no Hiro. Since I had only ran into him earlier that morning, to invite him along with us to find Mario, I thought perhaps there had been a language barrier and he didn't understand. He was from Japan, but his English was really quite good as far as I could tell. Both Rich and Janny were eager to get going, but I insisted we wait just a bit longer. And sure enough, about 10 minutes late, Hiro strolled into the square. He seemed nonchalant about the whole logistics of crossing the Minho! We all set off to walk the few blocks to the waterfront. Here we are, ready for the days adventure! 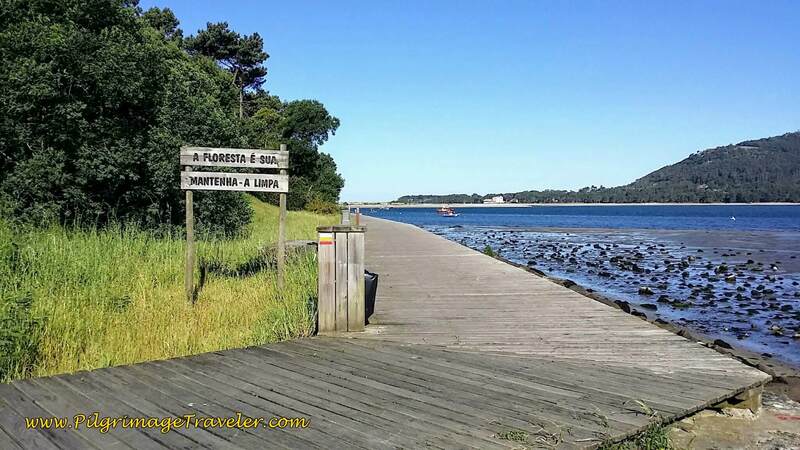 ...and joined a very nice boardwalk, shown in this photo along the mouth of the Minho River. 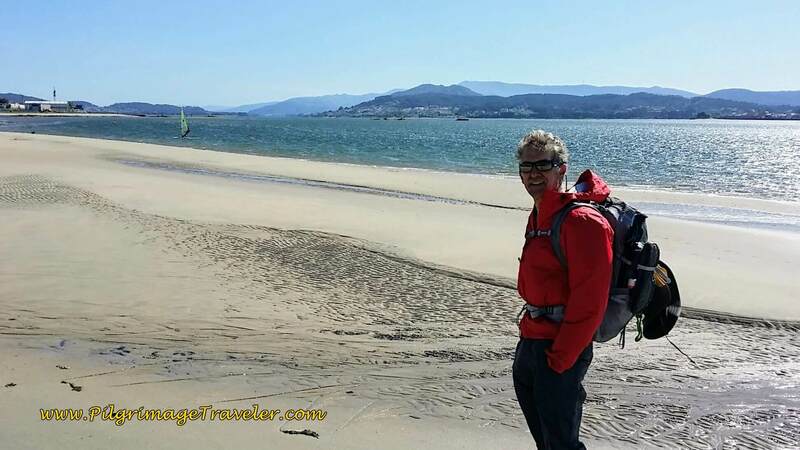 We walked another one kilometer until just before the beach, the Praia da Foz do Minho, coming to the O Forte da Ínsua restaurant with a large octopus on it. It was here that we found Mario's dock and him waiting with his boat. Since we had called, he knew we were coming. Everyone along the waterfront knows Mario, so if you get lost, just ask! When we would ask, they would just point in the direction we were going along the waterfront. Mario charged us 5 Euros each for the crossing. Here we are, tucked into Mario's small boat. Rich, ever the clown, was mocking our president Trump, and seeing that he was making a border crossing from Portugal into Spain, decided to go incognito! Too funny. The crossing was actually a bit choppy, with the wind, and we ducked under our hoods. Mario dropped us off on a beach in Spain, by the town of A Praia at the end of a boardwalk system. See the map above. 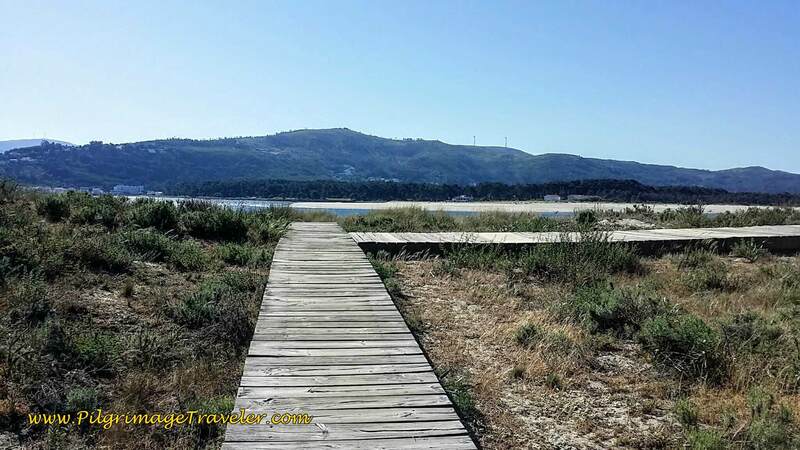 This boardwalk goes west on the Senda Litoral to A Praia and around the point and western end of the peninsula, to join a road, the Paseo Marítimo da Guarda to the town of A Guarda, where the Coastal Route meets up with the Senda Litoral. 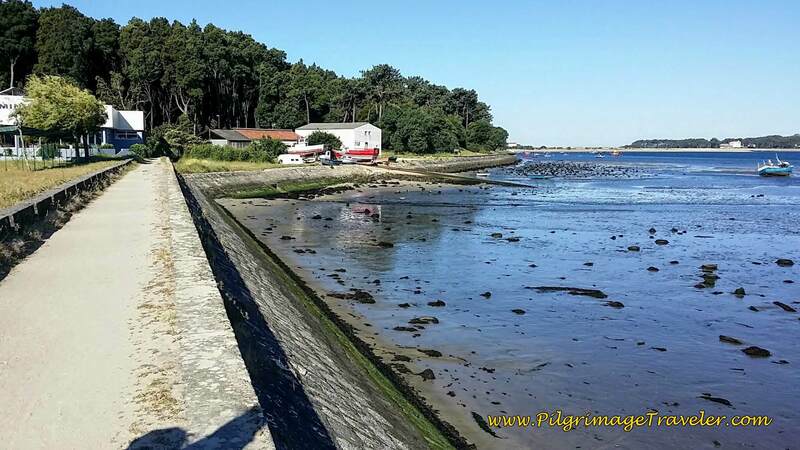 Here you can turn around and see the fort, the Fortaleza de Insua, built in the 17th century guarding the harbor of the Minho from its island perch. 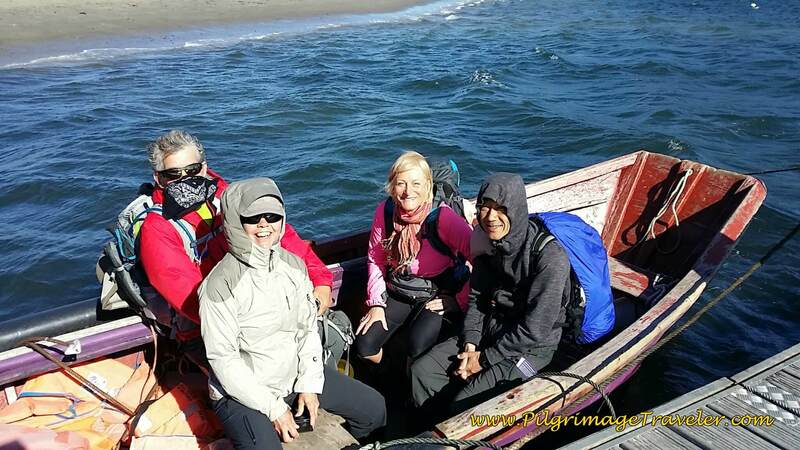 Janny and Hiro took the Senda Litoral to the west. Hiro thanked us profusely for helping him get a jump start on the day. 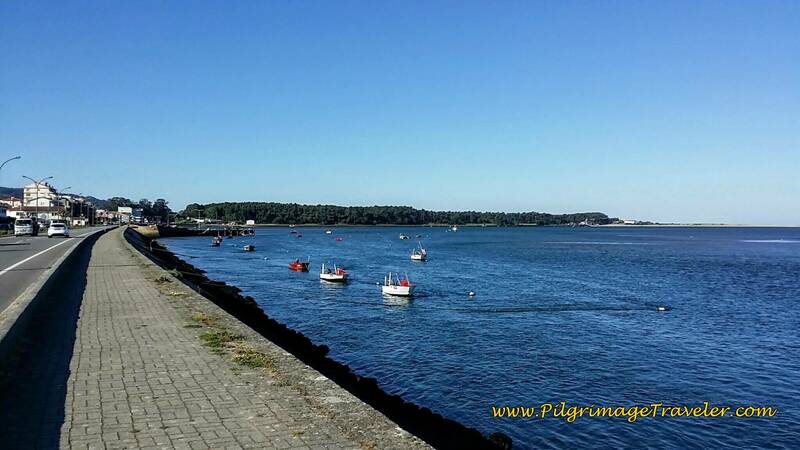 He realized that he would have been stuck in Caminha for quite sometime, waiting for the ferry, were it not for us. A deed well done and worth the small wait. We turned eastward instead, and toward the ferry dock, approx 1.5 kilometers away where it was our plan to meet Glyvia, our German friend who lives in Spain. 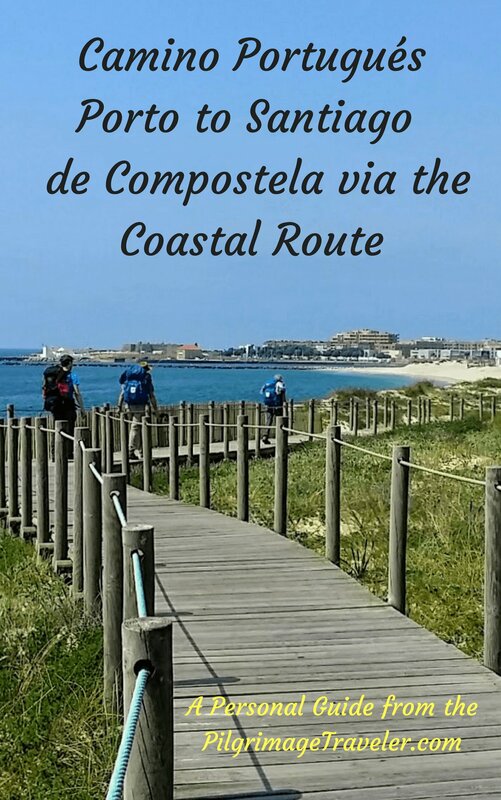 We followed the sandy road the Camino Armona, that runs along the beach, until we came to the the Praia (beach) A Lamiña. We walked on this lovely beach for a short ways, then re-joined the sandy road. 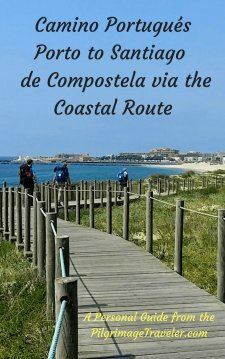 All along this portion of the Senda Litoral you can chose to walk on the hard packed sand of the beach or the road that runs right alongside it. 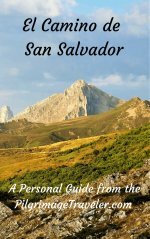 Essentially, we were walking the Senda Litoral backward, towards the ferry station, to meet our friend who was waiting for us. 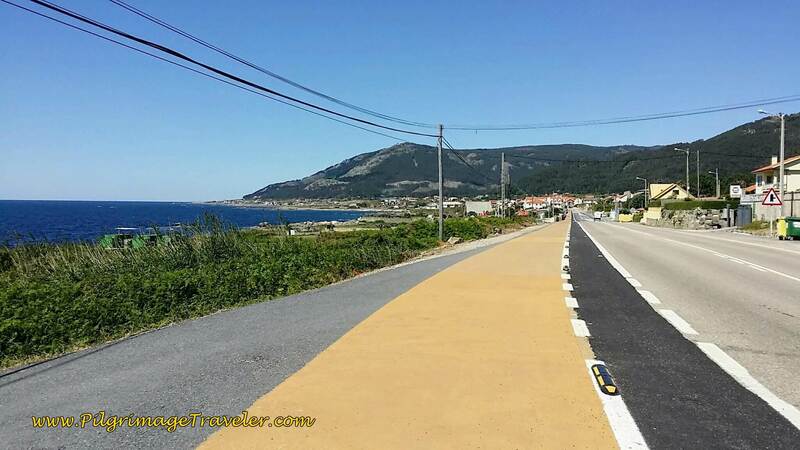 The sandy road becomes pavement, just after a tennis club, as we approached A Prasaxe and the ferry landing site, at the Estación Marítima. (not pictured). As we neared the Estación Marítima, who did we see, but Glyvia approaching us! She had grown tired of waiting for us (Spain is one hour later than Portugal, so she had been waiting for over two hours for us) and walked out to meet us! It was a glorious reunion among old pilgrim friends. 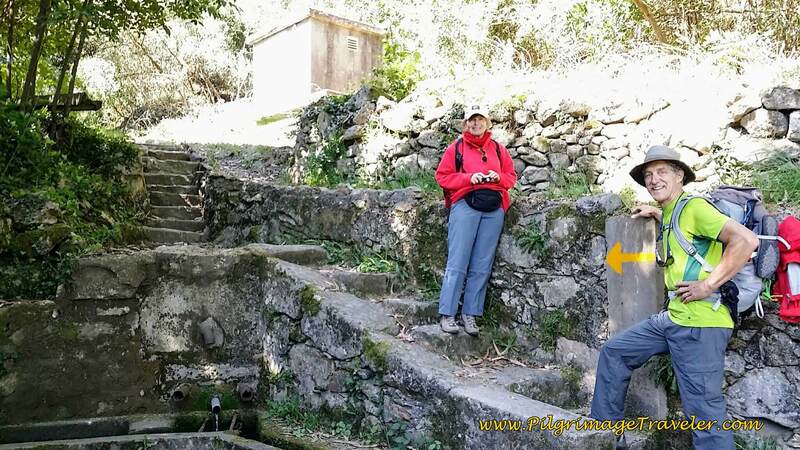 After using the restrooms, we set off and up the hill across from the ferry station, on a street called O Palomar. This climb uphill went for a ways and was a bit strenuous. 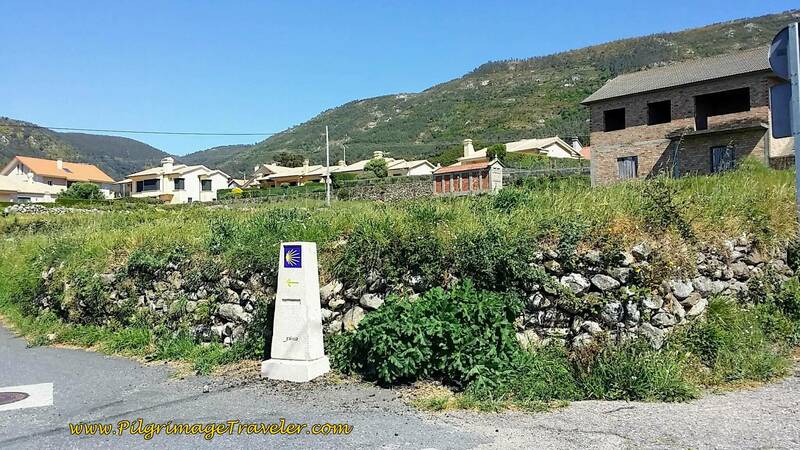 In about 1/2 kilometer, we came to the end of O Palomar, turned left onto Carretera de Camposancos and then an immediate right onto this side road, below, in the town of O'Couto. We took the first right in a few meters onto a quaint side road. We stopped here so I could snap a photo of Rich and Glyvia. 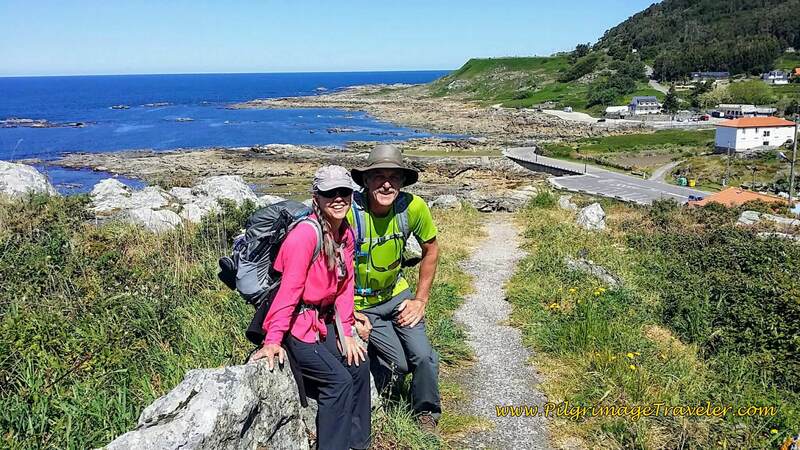 We were so happy to be together, and walking a Camino again! We chatted and chatted endlessly, the whole distance, filling each other in on our lives. 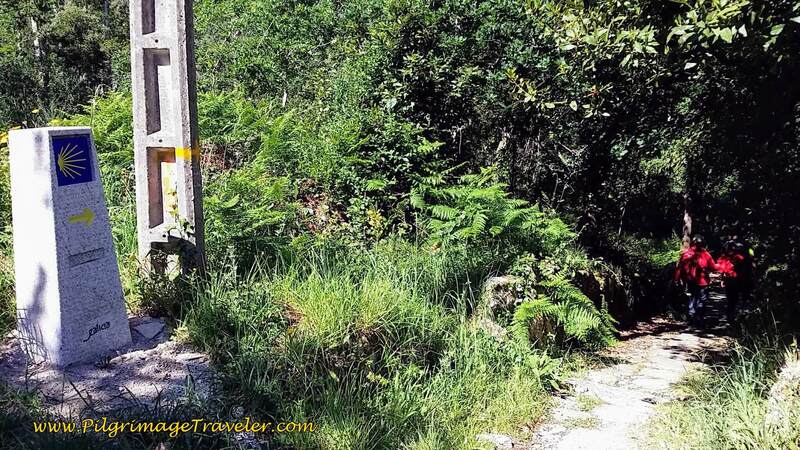 We continued to follow the yellow arrow on this quaint road, below, on day nineteen of the Camino Portugués. ... and walked by this old well. 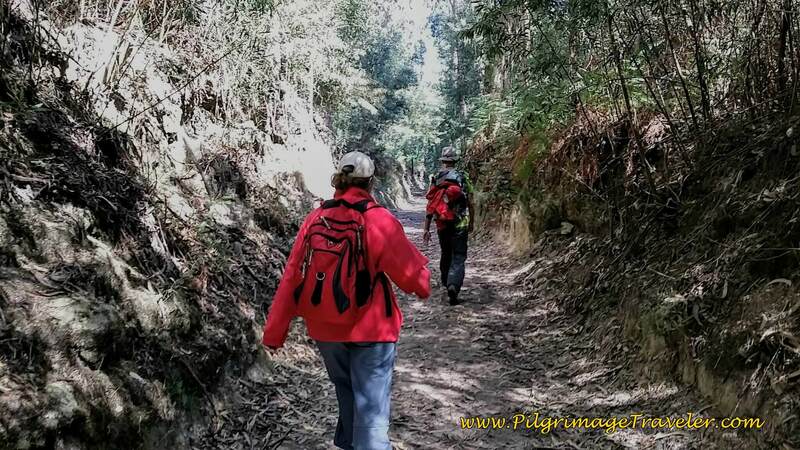 We continued through a forest on an enchanted path for a total of about 1/2 km. 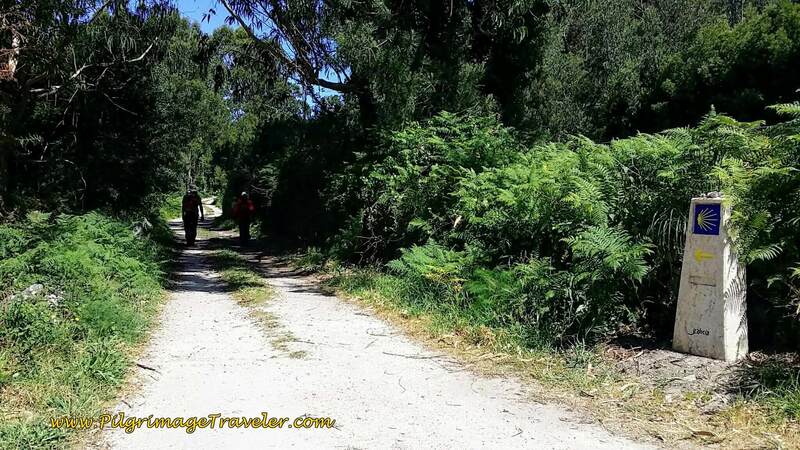 The forest path comes out onto the Avenida Paseo Portugal. This is a broad and busy avenue, but with nice sidewalks for the pilgrimage traveler. More importantly, there was absolutely no cobblestone! This avenue leads one into the next large town of A Guarda. As we were walking through town, Glyvia noted a waymark with a kilometer plaque already missing. She had been explaining to us how the municipality had been putting in these brand new concrete pylons, just during the last several months. 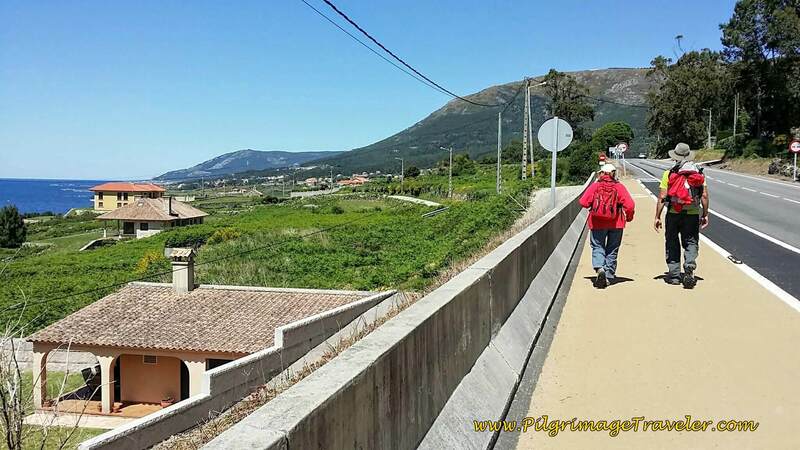 She had been watching the progress from her home in Viladesuso, our destination for day nineteen on the Portuguese Camino. 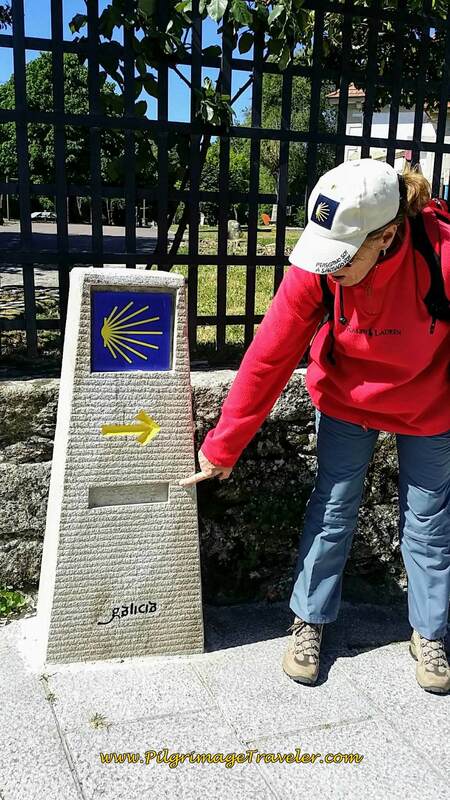 Fascinating that so many pilgrims take these kilometer markers as souvenirs. What a shame! The Avenida bends to the west and becomes the Rúa Rosalía de Castro, ahead. The street comes to a T and we went left onto the PO-552. At this juncture is the Pastelería Lameda where we stopped and had several pastries! We didn't take a long break, but kept walking and pausing to eat our delicacies. 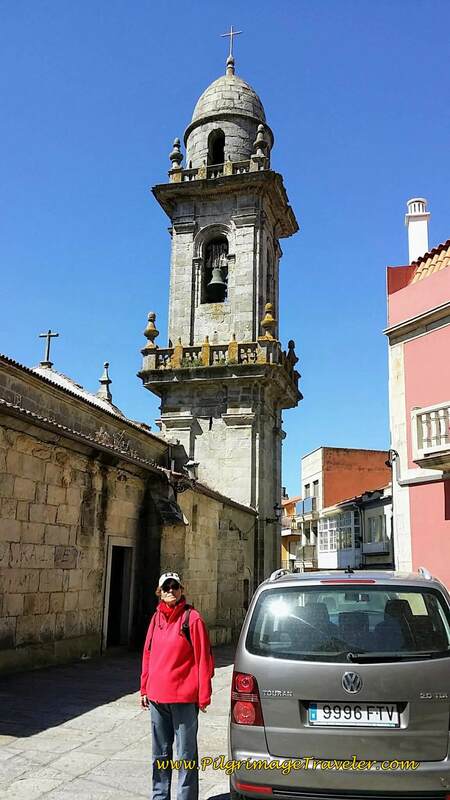 In about 400 meters, we turned left off the PO-552 and onto the Rúa José Manuel Andreíni, then took the next right on the Rúa Vicenta Rodríguez Cachada, to walk by this historic church of the Parroquia de Santa María. Here is Glyvia by its distinctive bell tower. While the church is not so very beautiful, it is a suitable landmark. After the church, we turned right onto the Rúa San Bernardo as it walks onward. 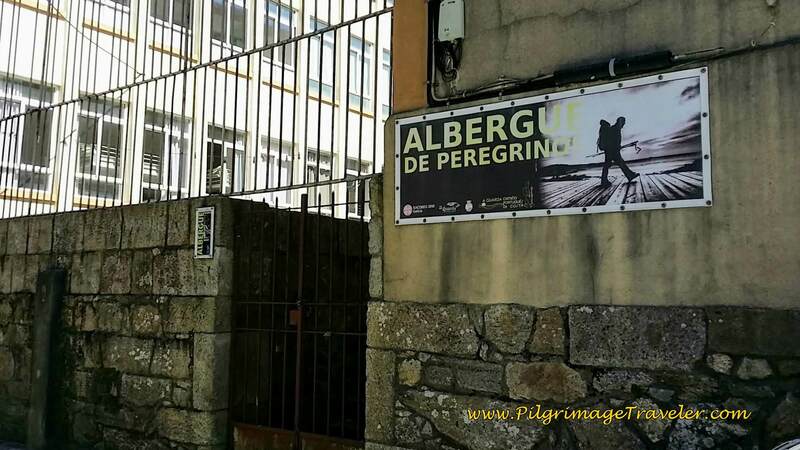 Shortly after the church, the Albergue de Peregrinos is on your left. 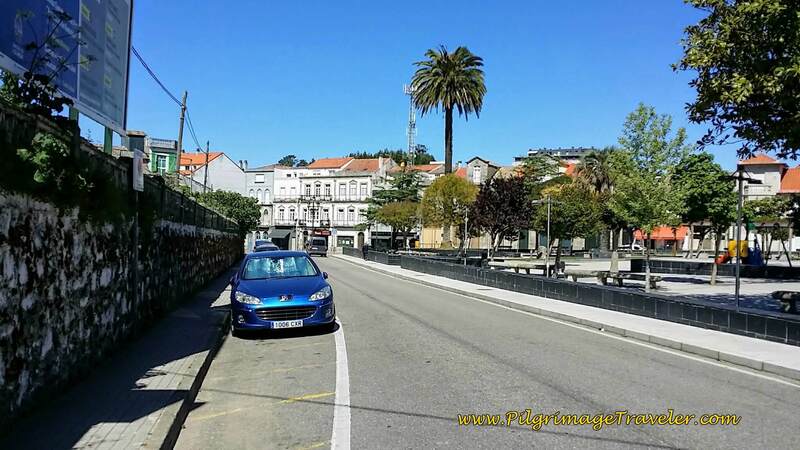 A left turn onto the Rúa da Guía and we walked by the Plaza of the same name. I took a photo of the charming Capilla Virgen de La Guía in the Plaza. The sight of a church always brings me to a present moment. 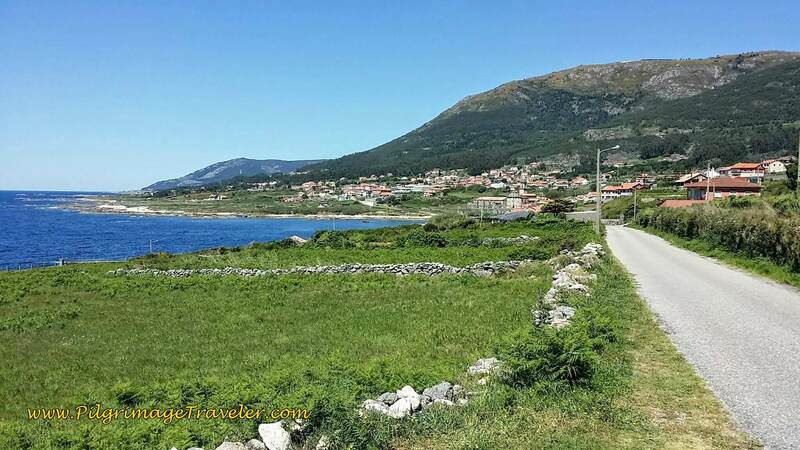 We turned right onto the Rúa Baixada á Praia, then left onto the Travesía Cachiños, where the city opens up and views of the sea on the west side now appear. The Travesía Cachiños becomes a short path, with a series of steps that lead you to the street below. The views of the sea here are gorgeous! We stopped to admire and photograph it. I took so many photos, that Google gave me a stitched version, below. After walking down the hill and the steps, we turned left, then right on the narrow pavement, to join the Rúa Baixada á Praia once again. Once down by the water, we walked around the small bay and past the beautiful Praia Area Grande, below. 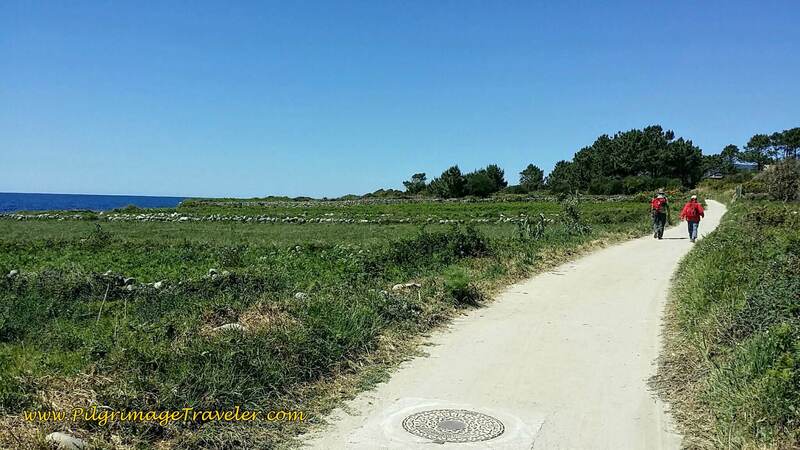 After the beach the Camino leaves the beach-front road and turns to the left onto a side road. Along the road is a long parking area along the coastline. 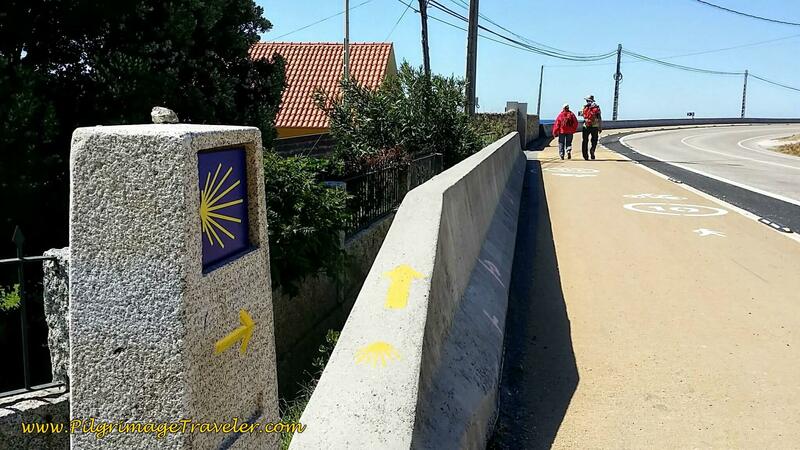 Within a few meters, the Camino takes a path to the left, shown below. 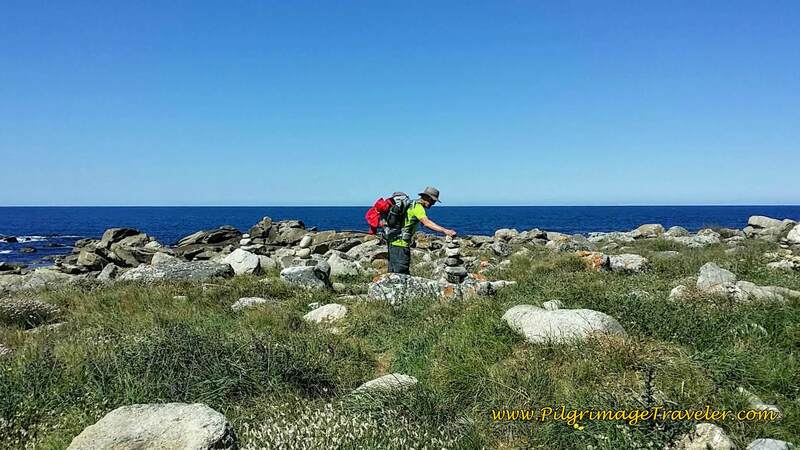 Here is Rich, along the coastal path, adding a rock to a cairn. This practice is said to also bring you into the moment. It was a lovely moment here, by the sea. 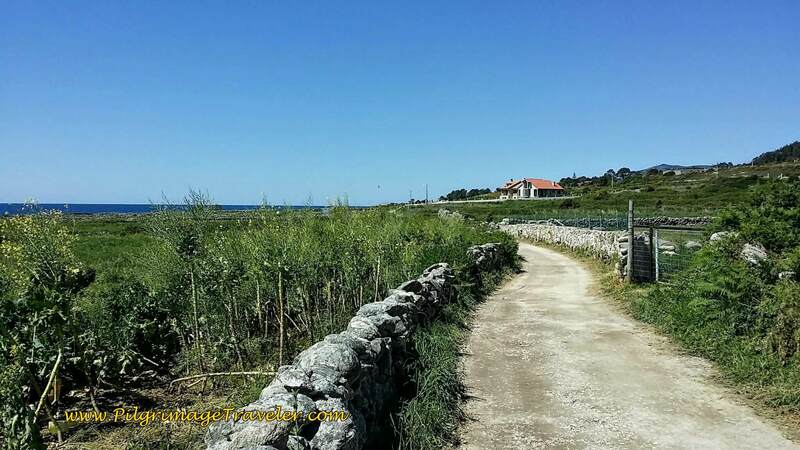 The coastal path, approx one km long, becomes a road just before the historic Cetárea Redonda (not pictured). Apparently this sea pen was used up to the late 1800's. 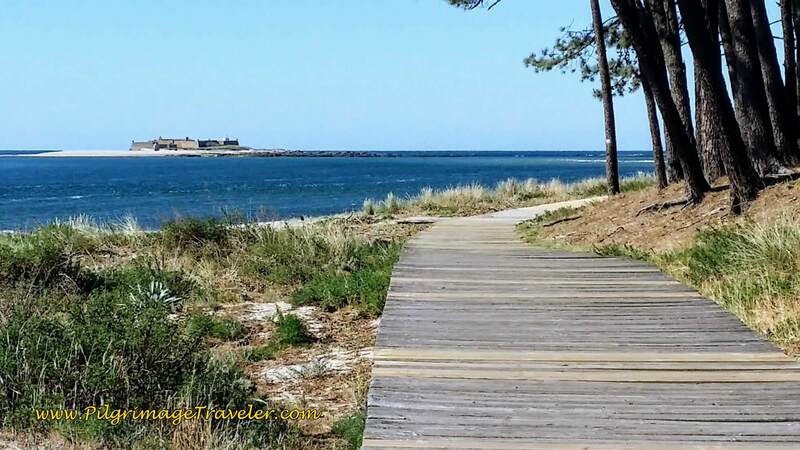 You can see a walkway leading towards the sea, to a sea farm per se, where lobsters and other crustaceans were raised. You may wish to walk out to see this round, rock pen by the sea. Click on the link to see a Google Map photo of it. We turned right after the historic site, onto a paved road, below, and headed back toward the main road, the PO-552. 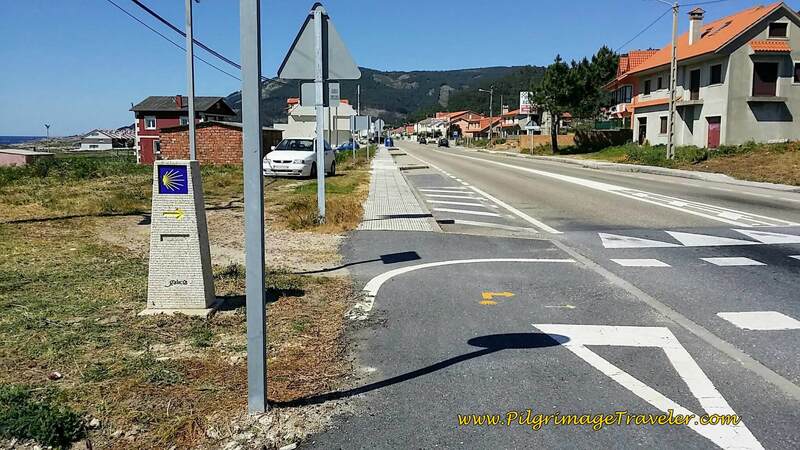 Just before joining the PO-552, about 300 meters onward, a lane turns to the left, which the Camino takes, avoiding the highway for awhile longer. This lane continues for about 3/4 kilometer, then once again the Camino joins the now-familiar PO-552. 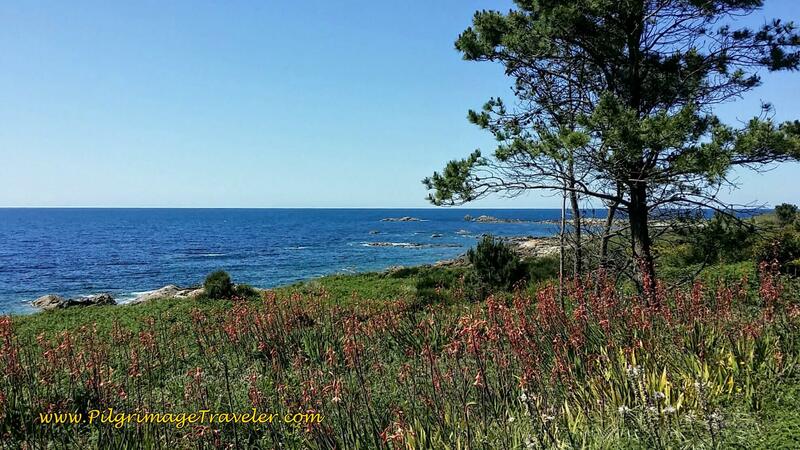 It would be almost impossible to walk directly along the rugged coastline in this next section. 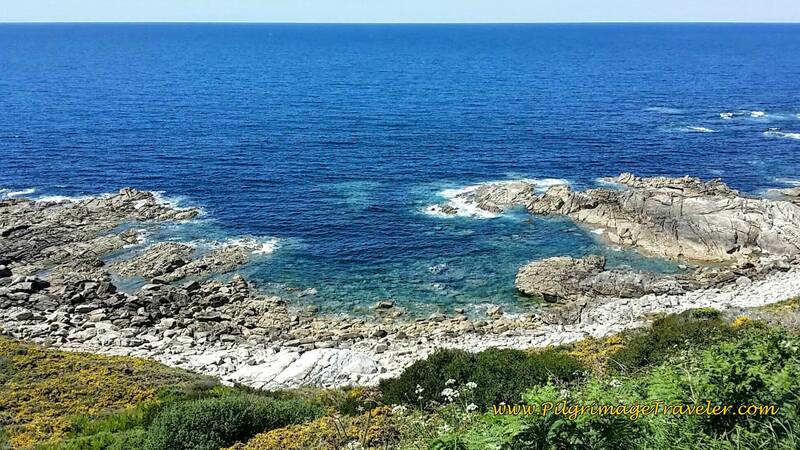 The views from the road are wonderful, with the sea constantly on your left. The walking is easy along the bikeway, despite being on the pavement. 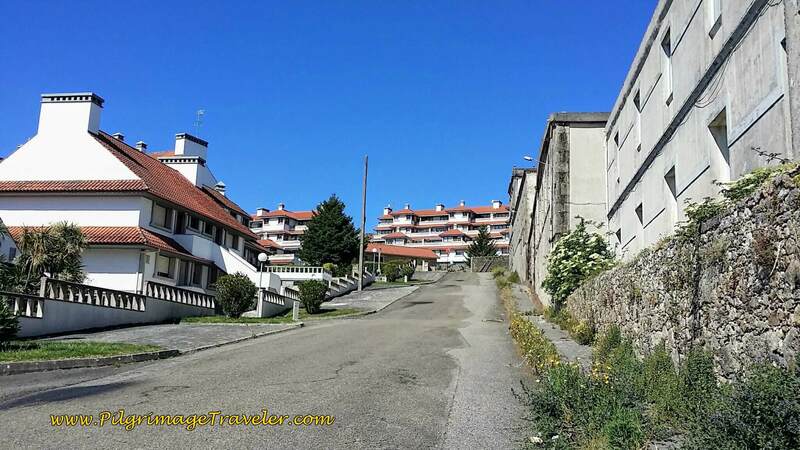 We walked up the long, gradual hill to the lookout point, the Miradoiro da Punta Bazar, with a car pull-out area. We continued to walk on the highway for almost two more kilometers. Just beyond the Miradoiro the Camino turns off the bikeway to the left onto yet another lovely path to walk toward the next town of Portecelo. 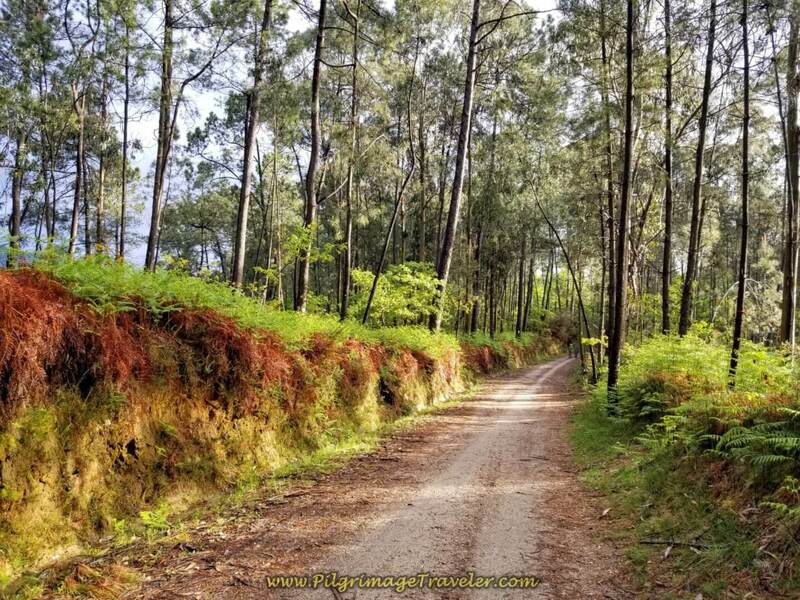 It is just over a kilometer from the turn off the highway to the center of Portecelo, on a quiet dirt road, that essentially parallels the PO-552 to the west. 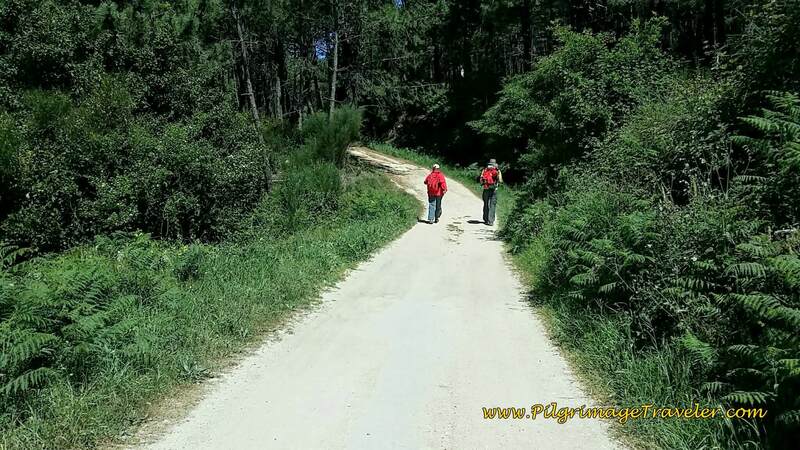 The dirt road ends with a left hand turn onto a secondary paved road, to walk you into Portecelo. There is a café here in town if you need it. 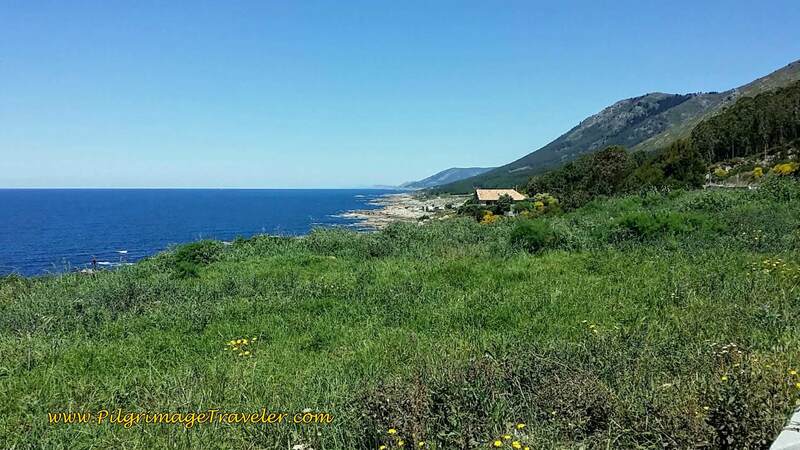 The wonderful views of the sea open to the pilgrimage traveler again, after leaving town. Spring blooms abounded. 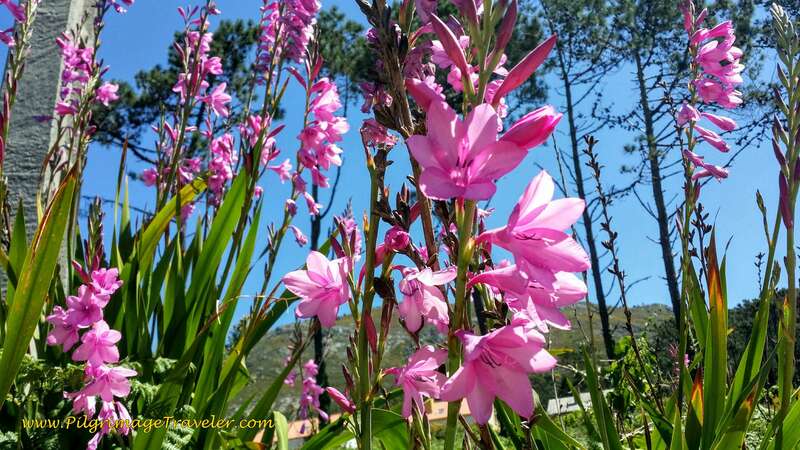 If anyone knows the name of this beautiful flower, please let me know! I'm sure all my readers would appreciate it. 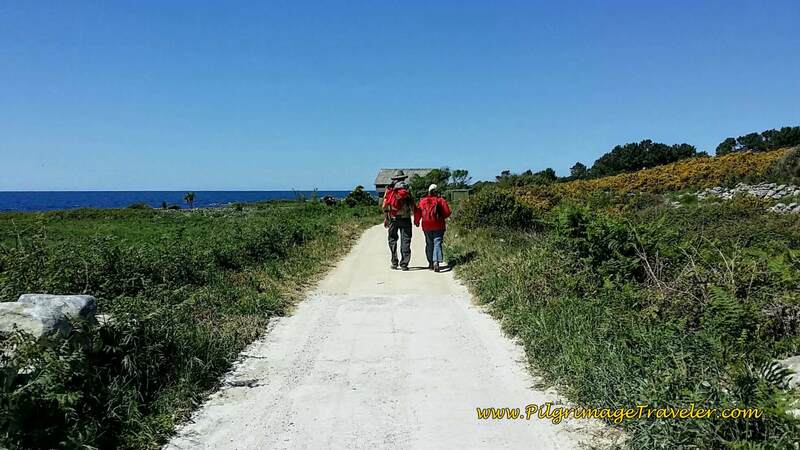 After walking on a paved road through Portecelo, the Camino once again turns off, to the left onto a lovely dirt road, and walks parallel to the PO-552 for a full two kilometers more. The walk is lovely through here, and though you may hear the highway to the east and catch glimpses of it, you will not see it so much. 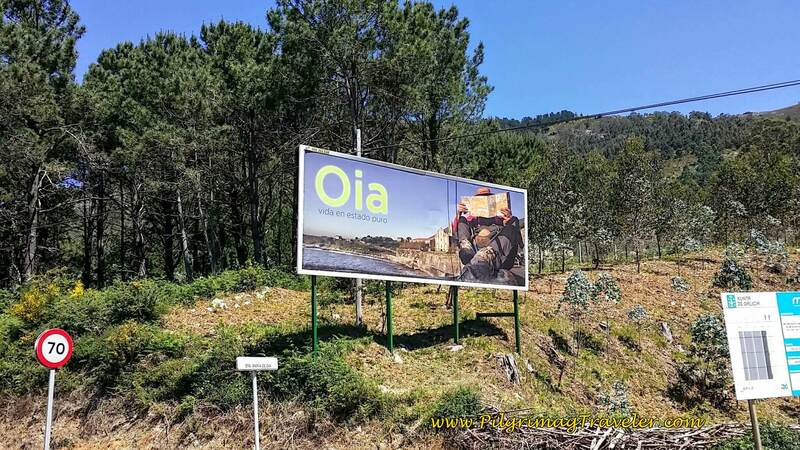 We joined the PO-552 here, at this sign (in 2017) and walked on the highway for almost another 3 kilometers, toward the next town of Oia, as the sign below advertises. Yes, that is a pilgrim on the sign! After joining the road, another long, steady climb ensues. 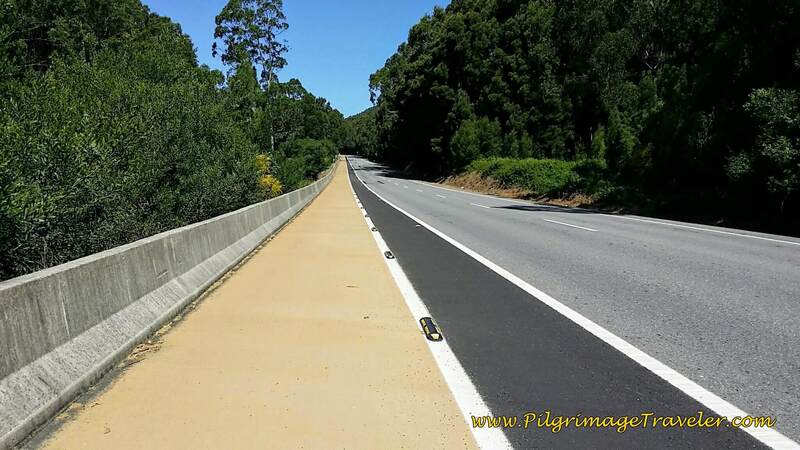 There is a nice bike path next to the road, making it a safe walk as well. 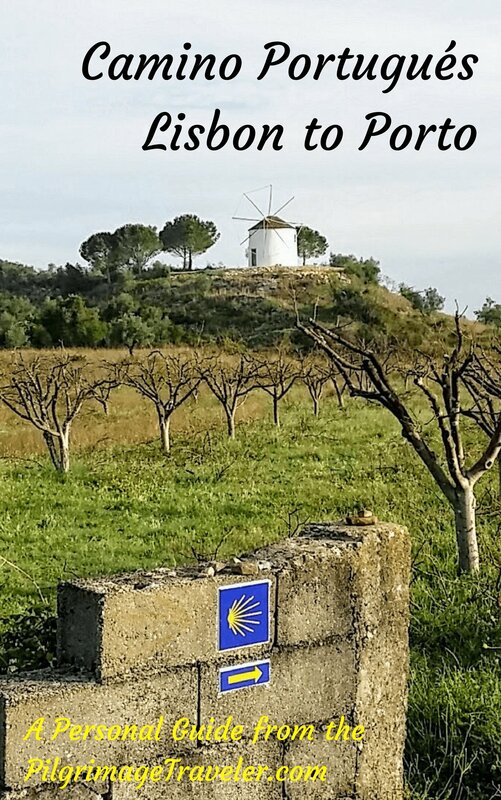 You pass by several viewpoints, the second one being called the Mirador de Tio Rincho. It was at the Mirador that we took a break, sat down on the grass and had a picnic lunch. We aired out our feet, as was our usual blister prevention practice. ...and you see this sign, below, where the Camino turns left onto a paved road towards the next town of Oia. 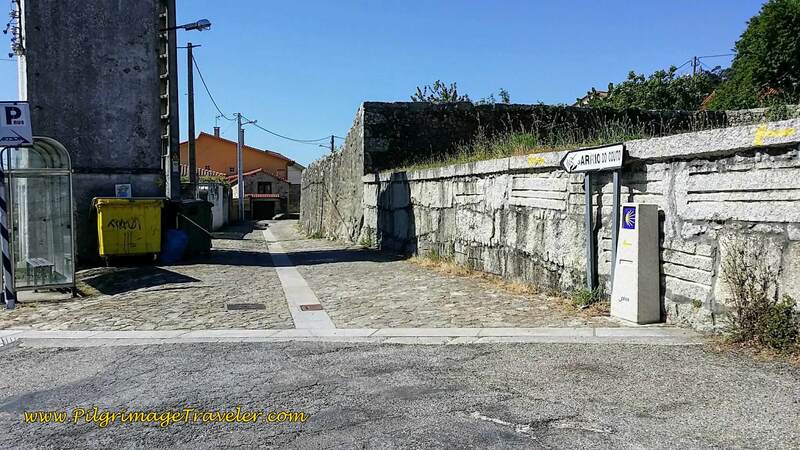 Sign "Camiño Portugués Pola Costa"
In only a few hundred meters you come to the historic Ermida de San Sebastián and Cruceiro (cross), rebuilt in the 1700's. It was closed when we arrived. Here is Glyvia, having a look around. 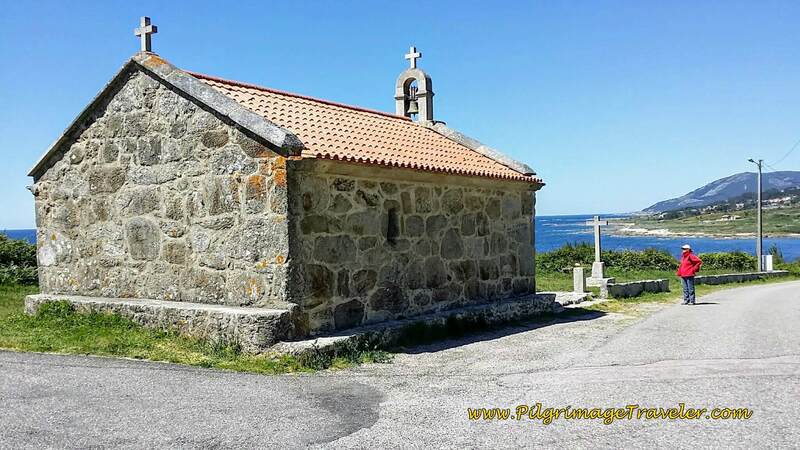 We paused here, to enjoy the moment by the church and the sea. Then, we continued on this road to Oia. When you come to Oia, the street, the Rúa Vicente López, below, is a quaint walk through the village. On the north side of town, the monastery, the Mosteiro de Santa María de Oia appears ahead, on a beautiful, small bay with the small beach, the Playa de Oia. According to Glyvia, the monastery is almost never open. 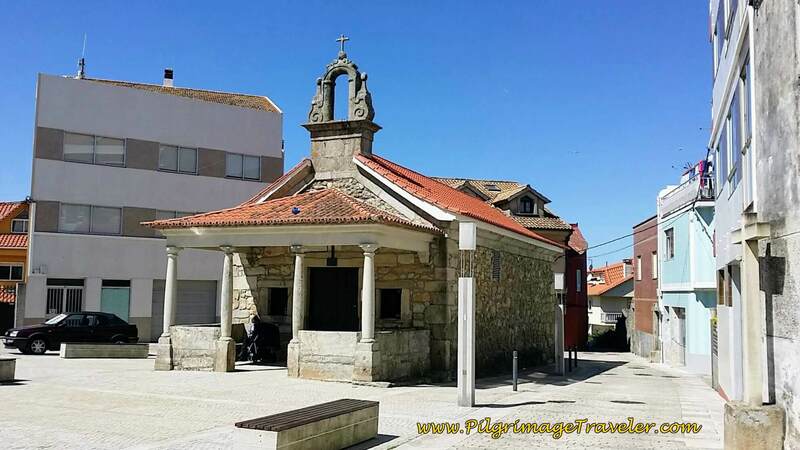 On day nineteen of our Camino Portugués it was, indeed, closed. It was a 1.2 km walk from turn off from the PO-552 to the Monastery. 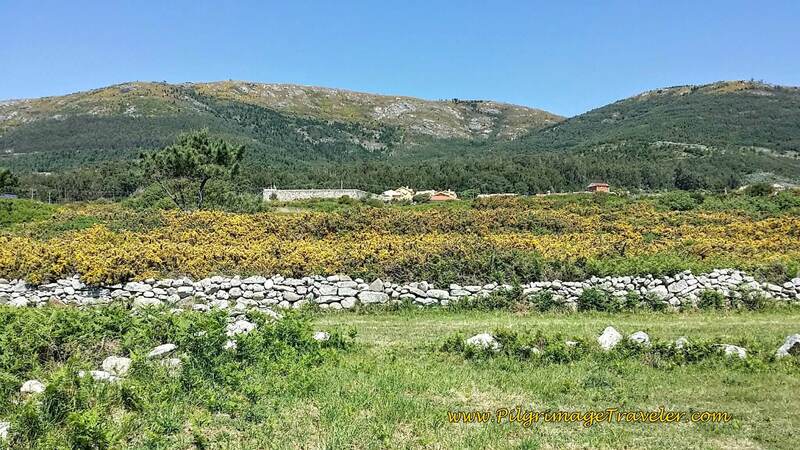 From the monastery it is 4 km to Viladesuso and 7 km to the Albergue in Mougás. There are hotels in Oia, if you are too tired to continue. 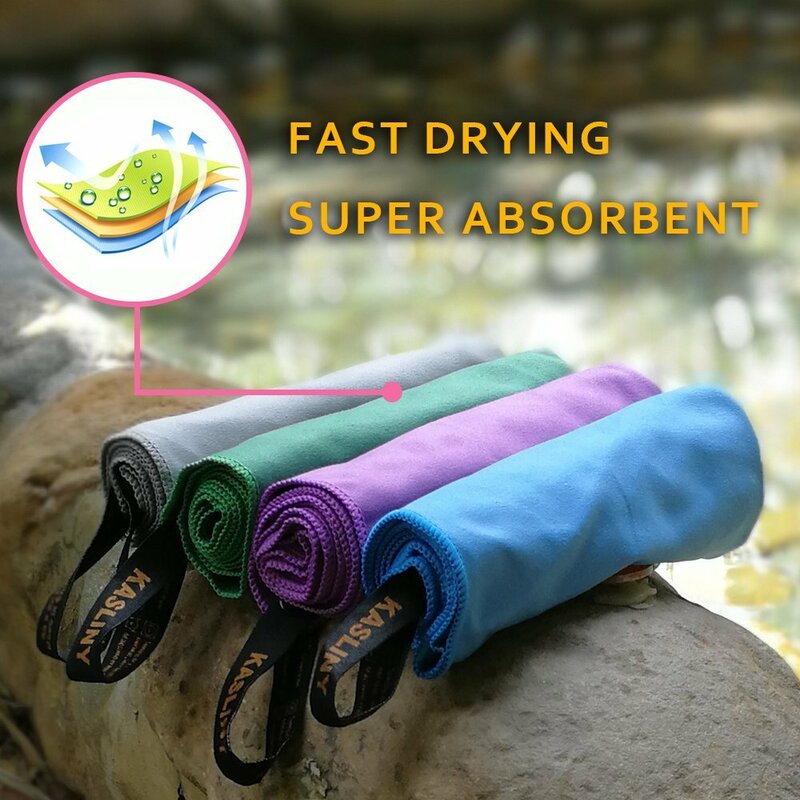 Click on the link to see them. Assess your situation at this lovely place. 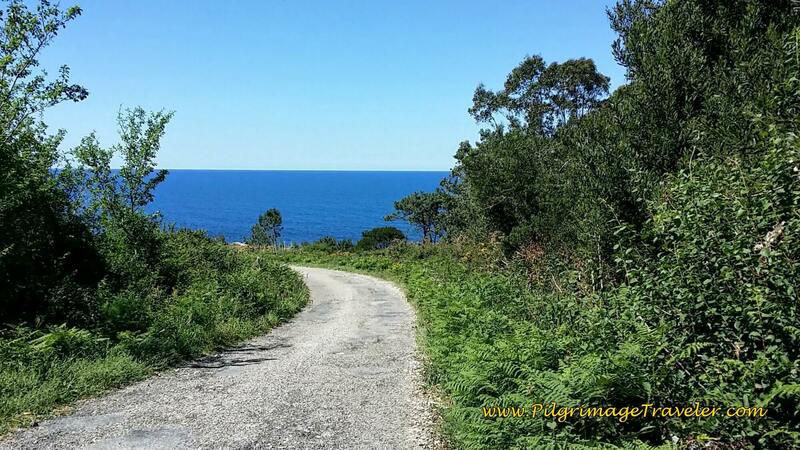 Continue on the paved road past the monastery, and in a few meters, turn left onto the dirt road that follows the sea northward, below. A yellow blooming bush, (I don't know its name) covered the hills. 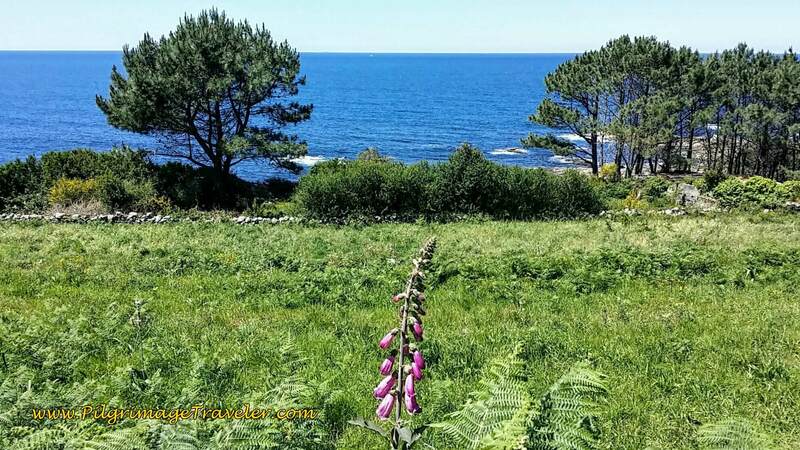 The road is paved with stone walls, the sea is on your left and a high ridge on your right to orient you and keep you walking northward. 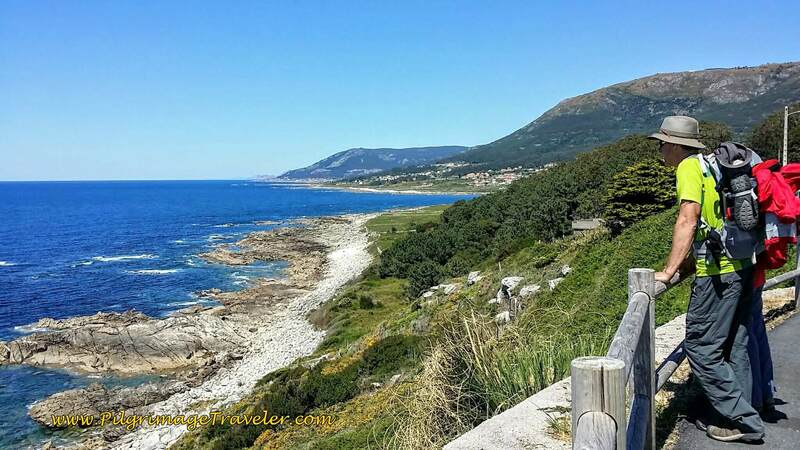 Continue for about 2.7 kilometers along the coastal road, keeping left whenever there is a road juncture. 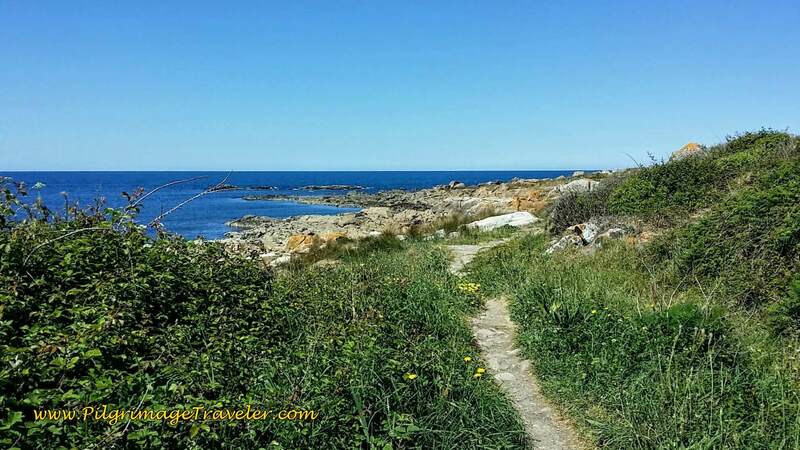 There is no beach in this long section, nor any closer road to the shoreline to walk upon, so there is no separate Senda Litoral, but the route is the same as the Camiño Portugués Pola Costa. You join the PO-552 after 2.7 km, at this photo, where you turn left to continue walking to the north. 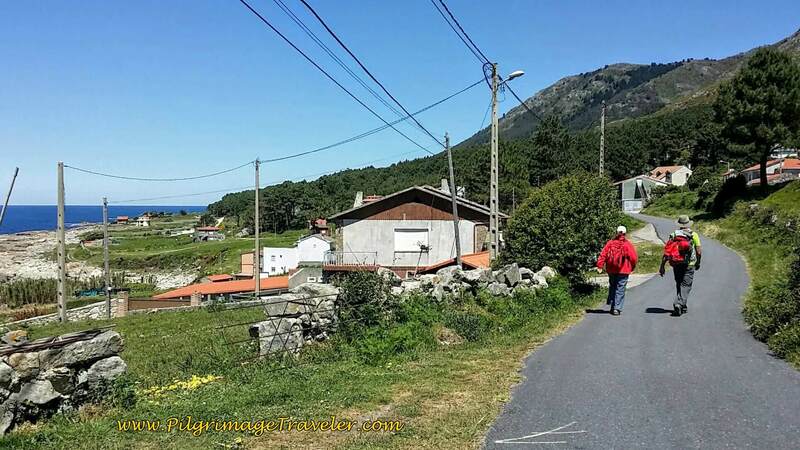 Then, walk a full kilometer on the highway to Viladesuso. 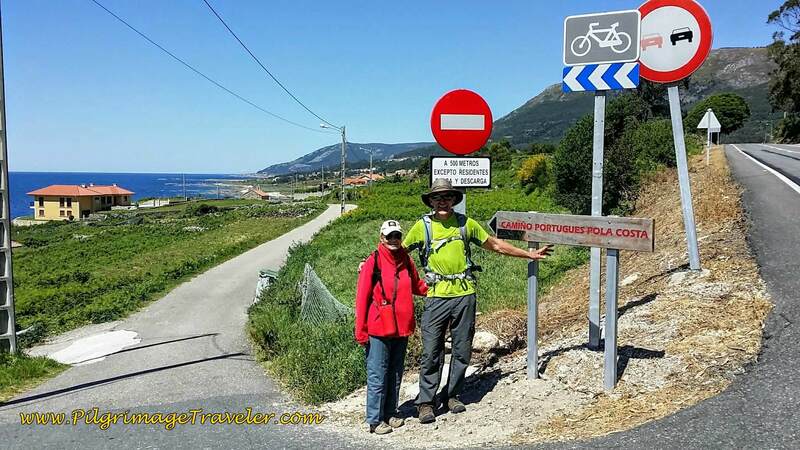 There are lots of places to eat and sleep along the highway in Viladesuso, if you are exhausted and can't do the final 3 km push to Mougás. 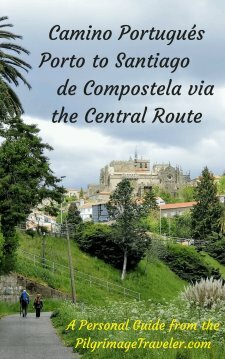 The Camino turns right off the highway, here. 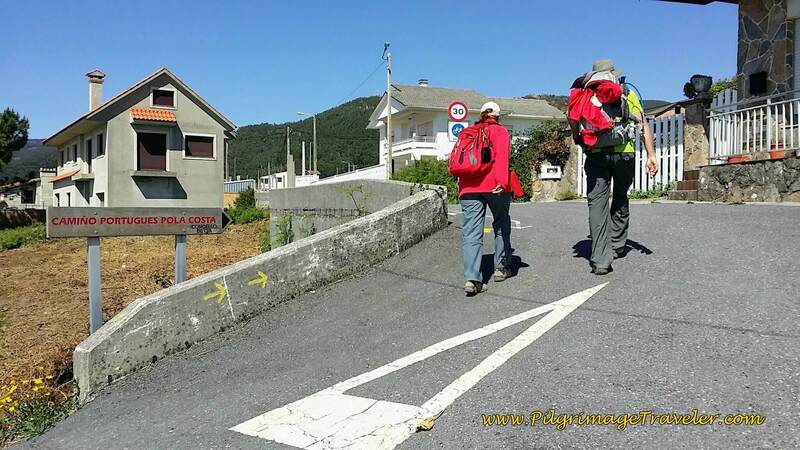 Next you walk uphill by the Camiño Portugués Pola Costa sign. 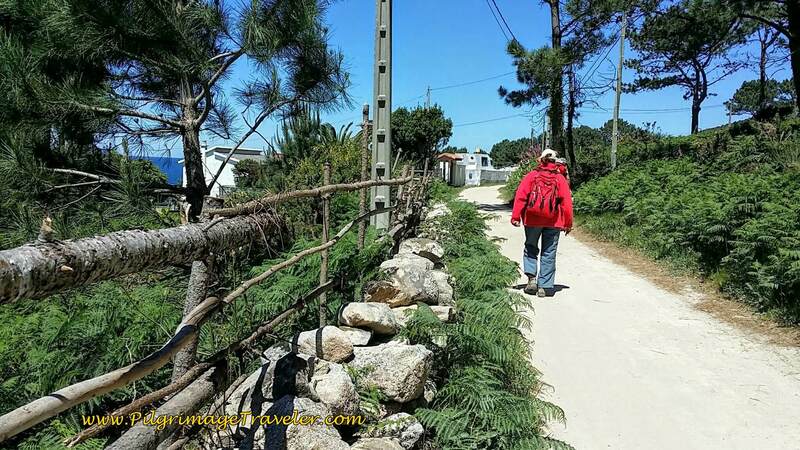 Our day ends here, where the Camino goes left toward Mougás, but we stay straight up the hill to Glyvia's house. 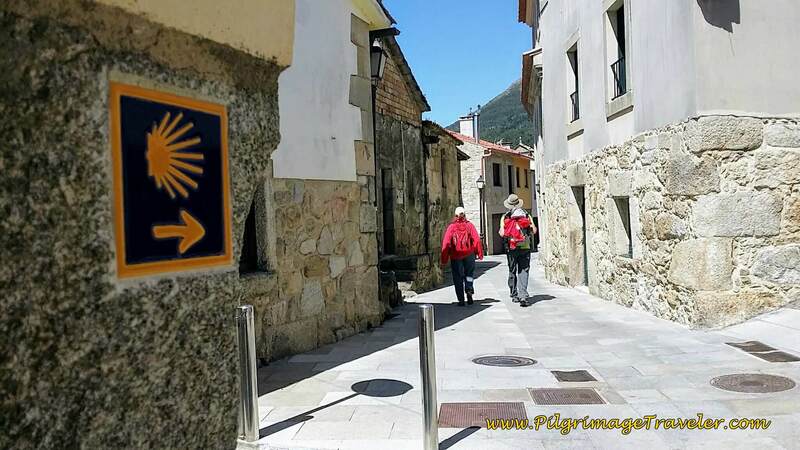 A few meters off the Camino, is the "Albergue de Glyvia!" We were happy, lucky peregrinos to be staying here, and had plenty of afternoon left over to enjoy her home. Glyvia let us wash all our clothes at her house! We emptied our packs entirely and washed absolutely everything! She loaned us clothes/robes to wear while ours were being done. We sat on her back porch with a view overlooking the sea, sipping beer while our clothes washed. She made us a fantastic dinner: Lots of wine, pasta carbonara, fresh tomato/mozzarella salad, German cake and coffee. We thought we had died and gone to peregrino heaven! 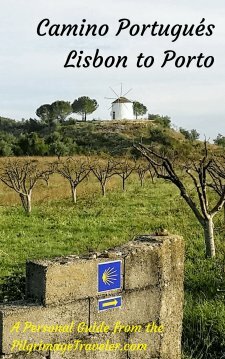 We gave her "albergue" a 5-star rating! The adventure was marvelous on this day, and the walk glorious! 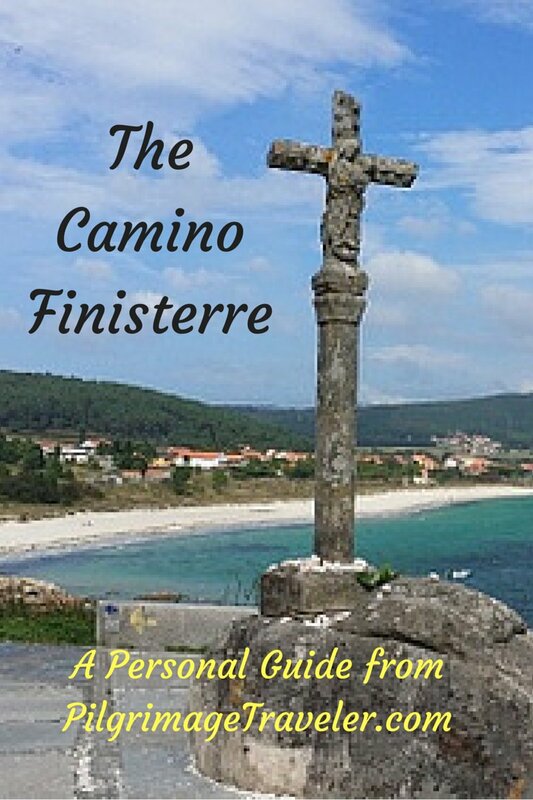 We felt fantastic that we had helped out a fellow pilgrim on his way across the river into Spain. 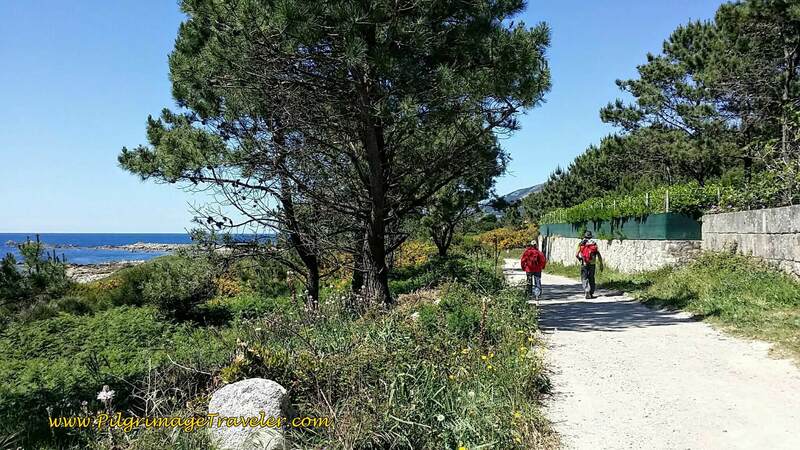 Even though we did not see Hiro again on day nineteen of our Camino Portugués, we would see him many more times on the rest of our journey, and be reminded of how far kindness goes to seal a community. Meeting up with our friend Glyvia was so very, very nice. 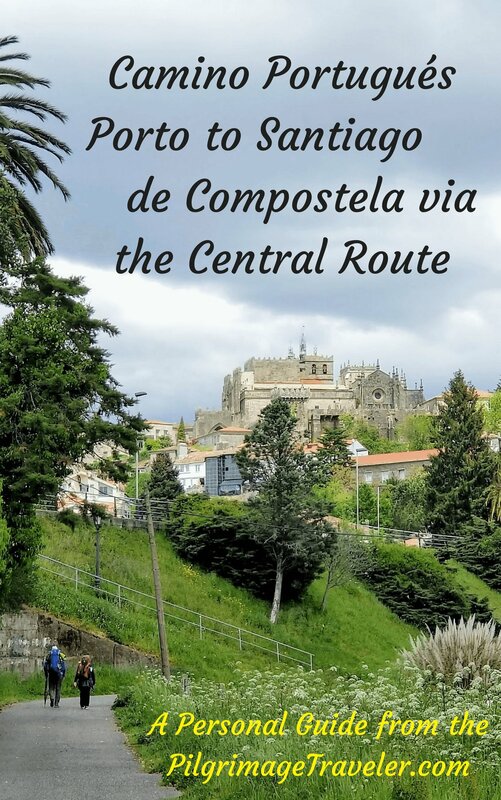 It was quite whimsical, we thought, in the fall of 2015, after getting to know her on the Camino Primitivo, when she invited us to her home along the Camino Portugués por la Costa. Yet here we were, just less than two years later, in her fabulous home. It was a spectacular opportunity for us. We had made a life-long friend. 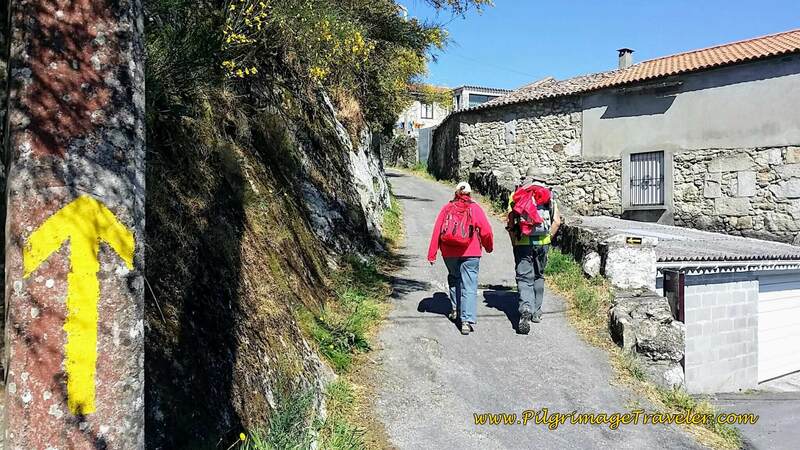 That is what the Camino does for you! 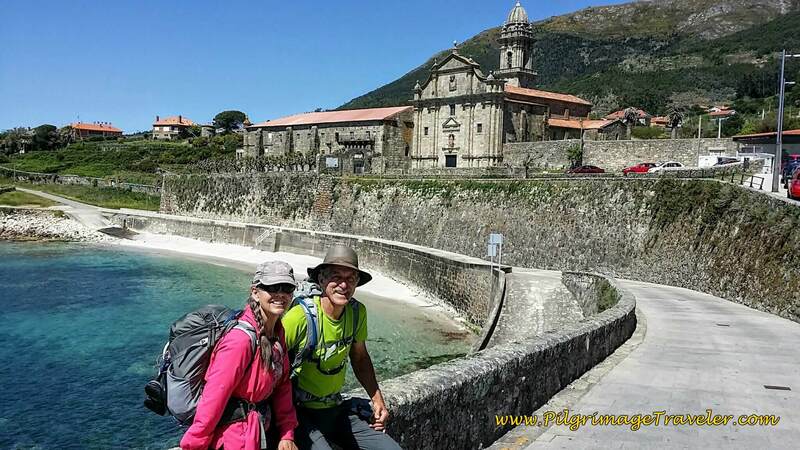 While the walk from the ferry station to her home was longer than Glyvia had remembered, it being 21.5 kilometers instead of 16, she had suffered a bit, just to join us on the walk. She got two blisters, which we treated that night. She was so very tired afterward, and we had walked her slower pace, out of kindness towards her. She had had a rough two weeks over Easter, barely one week prior, having suffered from a flu-like illness. I admired her courage in walking so far with us, so soon after an illness. She was so thrilled with our company, on the walk and having us in her home, that it touched our hearts so very much. She is a divorceé, trapped in a home that would not sell, living alone in a foreign land. On top of her tiredness, she was so fabulous a hostess! The kindness that we received from her, in her home was monumental. We had blessed others, and now we were being richly blessed. It was a wonderful feeling. 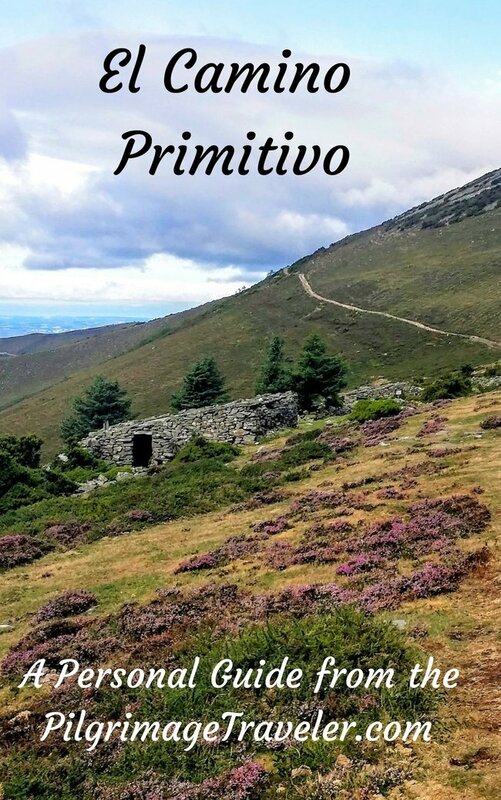 She had more than lived up to the name we had given her on the Camino Primitivo ~ "Camino Mother." In fact, Glyvia told us how frequently she rescues pilgrims who are tired, thirsty, hungry and/or lost, stumbling by her house. She gives them snacks and water. 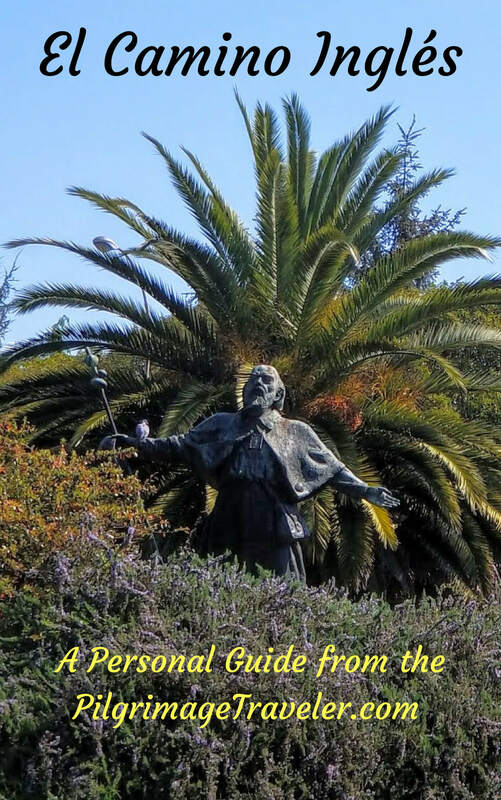 She is a blessing to all pilgrims who need that extra boost to make it to Mougás! Hats off to you, dear Glyvia! 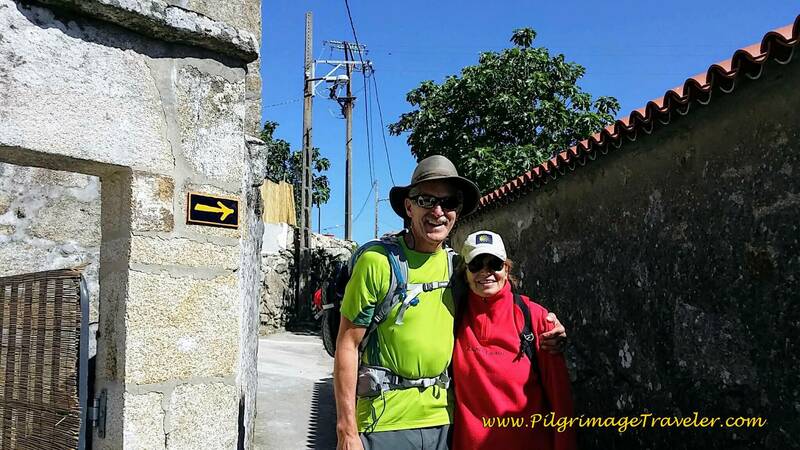 May your own day nineteen on the Camino Portugués be filled with acts of kindness, so that the circle of Love will never end! 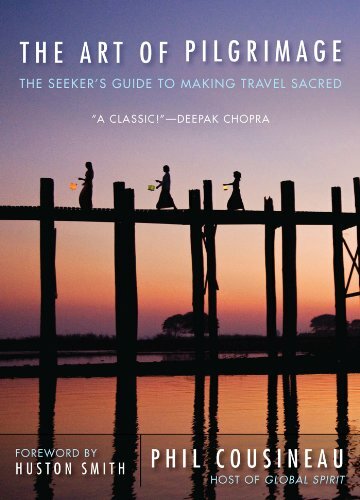 May your steps backward to lend a hand become second nature on your own pilgrimage travels and throughout your life! Ultreia!